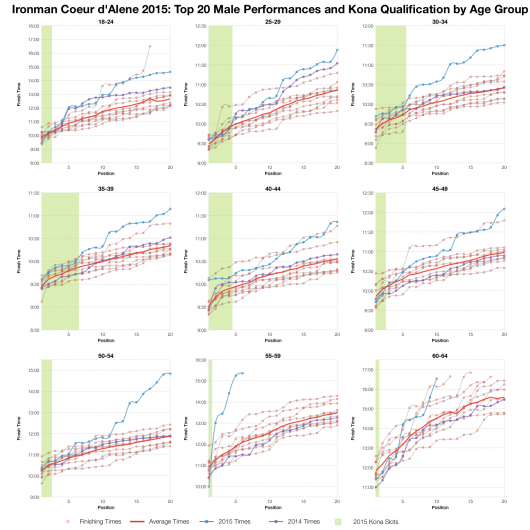 Ironman Coeur d’Alene is next in this week’s series of results analyses. 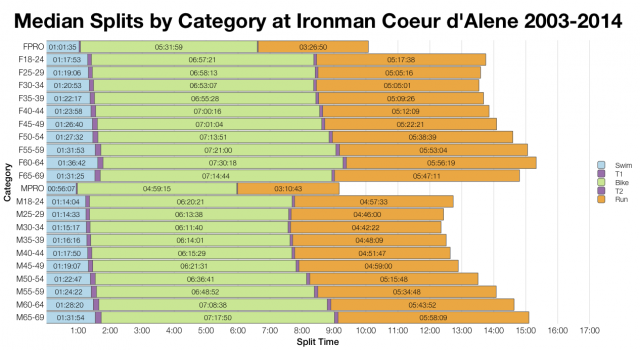 It looks to have been a tough day of racing in Coeur d’Alene; hot conditions very clearly had an impact on performances in the field. 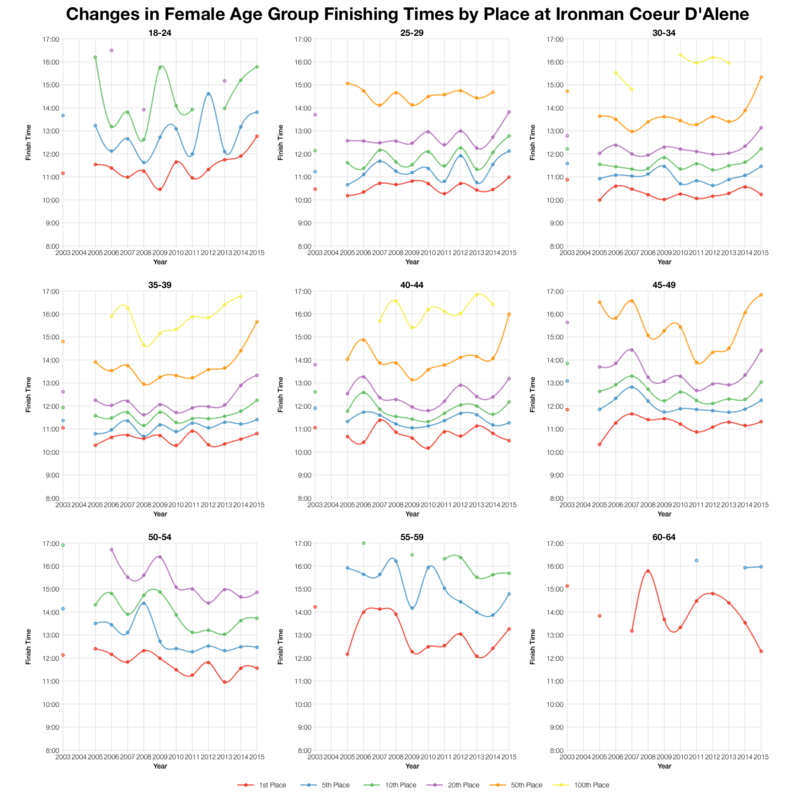 At the very front of the race times aren’t hugely changed, but as we move further back in the field the impact grows. 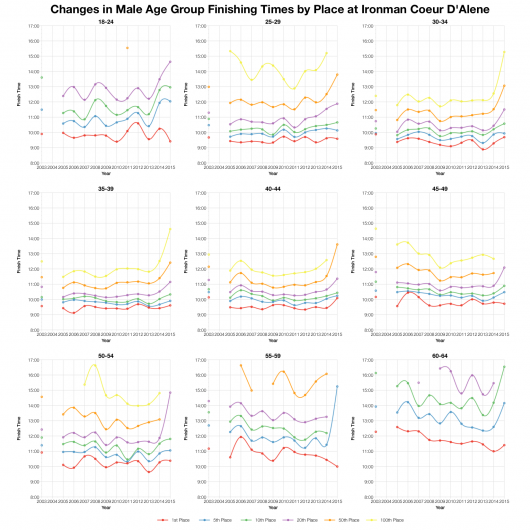 It’s clear from the medians that this year’s bike and run times are significantly slower than usual. There’s little to no impact in the pro ranks, but amongst age groupers the shift is almost universal. 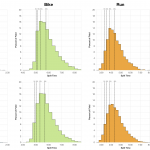 And it’s all the more clear when we look at the split distributions. 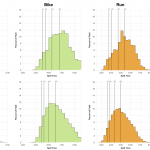 Median points shifted back on bike and run and because of this the overall distribution is much slower too. The swim was a little faster though. 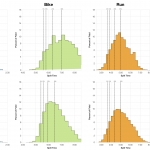 What’s more interesting is the impact on the top 5-10% is much smaller; the bike splits for the top 5% came out a little faster in fact. 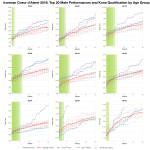 It may be the fastest athletes experienced less of the tough conditions and so the impact on performance was smaller. 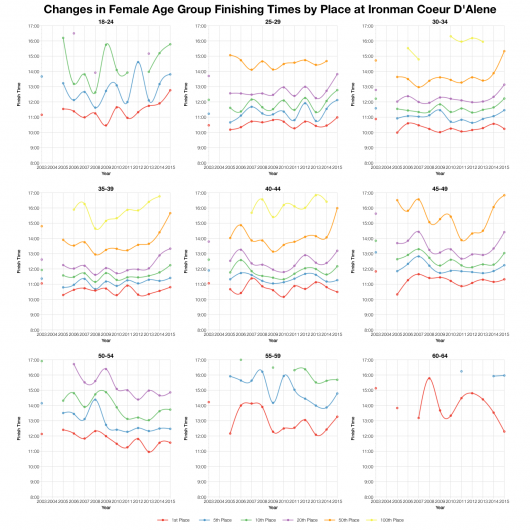 Comparing year-for-year shows a similar pattern, times for first place in each age group aren’t that different to usual, but as you move back through the field the finish times drop off revealing a far slower race. 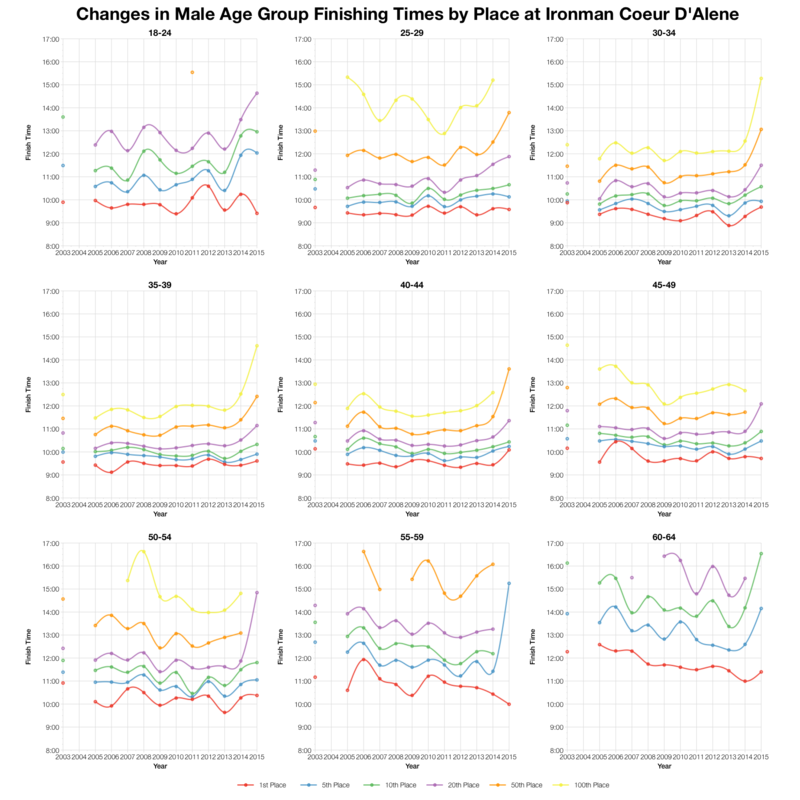 Looking more closely at the front of pack we can see times are generally slower than average and there’s a much quicker decline in times than is usual at this race. The top 5 in most age groups perform much closer to the averages, sometimes even outperforming them, but further back we start to see some of the slowest splits in the last 10 years. 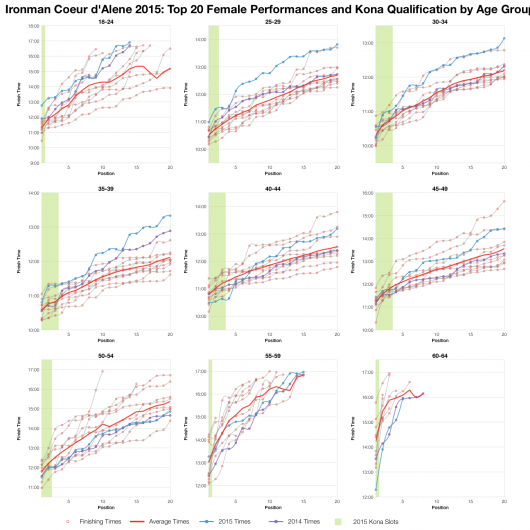 So while conditions did impact the field as a whole this seems to have been mostly felt further back in the race; at the Kona qualifier level requirements remained as high as ever. 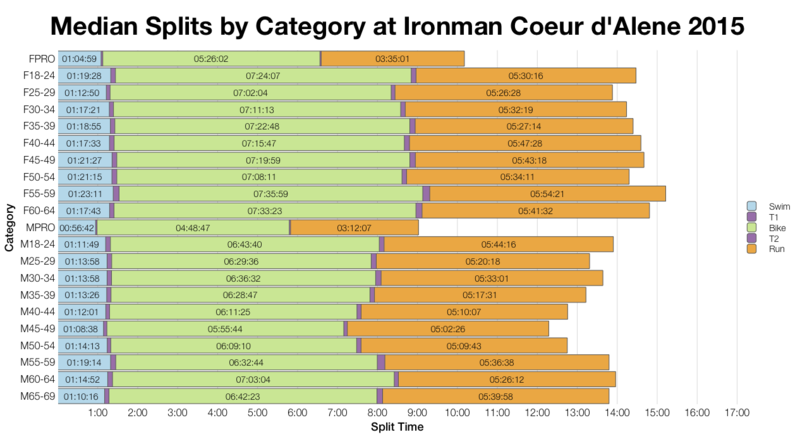 A spreadsheet of the full results and splits from Ironman Coeur d’Alene 2015 is available on my Google Drive.